Is blogging cramping my "real life"? - Mooiness! Is blogging cramping my “real life”? That blogging is addictive is a well-known fact, especially to other bloggers. That it takes a good part of each day, not just to write and compose a post, but also reading other blogs is also common knowledge. So I’m not talking about that. Let’s just accept for the sake of my argument that I’ve already allocated a chunk of my daily existence to this little activity. Even though a slot has been made available for blogging, I feel that it is also starting to enroach into my other “real life” activities. Specifically the enjoyment of them. Bloggers would know what I mean by this. You walk around, seeing, hearing and feeling things, tasting food, and living life basically. But you have this incessant thought while all of it is happening: can I and how do I blog this? 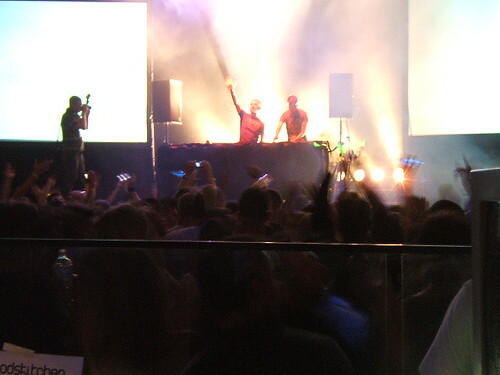 Using Saturday night’s outing at Godskitchen as an example, I wish there were two of me. One who was there purely to party, and one who was there as a blogger. The partying guy would just let loose and dance and socialise with abandon. The blogger guy would seek out cool camera angles, and figuring the good spots for taking video clips. Oh and the blogger would carry two separate cameras: each dedicated to video and photos respectively, and they’d be higher end stuff. I’m sure the official photographers had fun on the night but they were there doing their job so they can be completely concentrated. I take photos and video clips because it’s my hobby, but I’m there to have fun first and foremost. And I think because of both things fighting for attention inside my head, I think I only achieved 85% of both activities on the night. Yeah I had fun, but I’m thinking I could have had *more* fun if I wasn’t thinking about blogging it. It is fitting then that the batteries for my camera ran out with 2 hours left in the night, to let the music take over me completely. The other extreme is the guy selling kebabs upstairs. 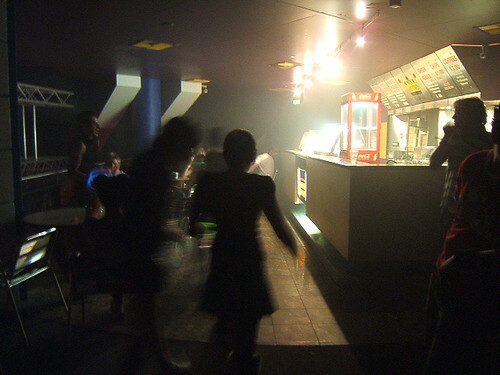 Even if he liked dance music and raving, it must kill him to be behind the counter and not out there with the rest of us going crazy on the dance floor. So I can’t imagine him enjoying his job that much, even though it’s his chosen livelihood (it’s a separately run business from the club). How cool is it then to be a DJ, doing what you actually love and getting paid for it? This entry was posted in Blogging & Blogosphere, Personal on Monday October 2, 2006 by mooiness. well…you could perceive the matter from an alternative angle…you do need to enjoy something BEFORE you can blog about it.otherwise,its contents are simply undeserving of attention.hence,it would seem completely paradoxical to claim that blogging cramps your life when it somewhat enriches instead. and yeah…it would be superb to own those specialised cameras and gizmos. hobart: you make a very good point. If I didn’t enjoy something, I probably wouldn’t even blog about it, or care how good the blog post is if I did. Man, don’t you wish you were as popular as the DJ ? look at that ! I know what you mean.There are times where I keep thinking about blogging this and blogging that and face everyone else laughing their heads off me taking yet another picture of a french fry. Maybe deep inside we all want to be professional bloggers:). sourrain: hee hee, not only taking a picture of a french-fry but it must be at a “cool” angle as well. Hahah! Yeah when I don’t think about blogging, I can just totally let go and be in the moment. But like you’ve said, sometimes it’s also good if a moment was blogged about and can be reminisced upon later. Yeah, I would love to be a DJ too haha. I have had a fling with a DJ, plus my bf and his flat mate have both done a little bit of DJing. the equipment is so cool, and I could just spend hours going thru the tracks, trying to pick out all my favourite songs! btw there’s a new best of Ministry of Sound CD, I haven’t got it, but listened and it’s not bad. have u got it? I have got Sessions Three though, the next most recent and it’s pretty good. I haven’t got the latest best of, “The Annual” right? The tour is end of this month. I don’t know if I’m going yet. I’ve got Sessions 3 – that is quite good. I went to that tour a couple of months ago too. girlstar7: ah you talking about the “Classics” CD. Yeah I saw it advertised, I might check it out on the weekend. Lyn: good point. Blogging does make us see things in a different way, or to be more observant of our surroundings.